Creating raised bed vegetable gardens is an incredibly simple, effective way to grow food for your family, and planting perennial vegetables and fruits will ensure that your land will keep producing food for many years to come. If you've already planted your vegetables and are ready to take the next step and start cultivating your own fruit supply, propagating fruit trees from branch cuttings costs next to nothing, and can quickly create a veritable forest of food. Read on to learn more about this simple, affordable way to grow your own fruit trees and berry bushes. Fruit trees cost anywhere from $20 to $100, which can be cost-prohibitive for some, especially if you’re looking to establish a neighborhood-scale orchard. Some people attempt to grow their own from the seed of fruit purchased in a grocery store, only to find out that most fruit trees do not ‘grow true’ from seed. In other words, the fruit produced by a tree grown from seed rarely resembles the fruit that it came from and is typically a half-wild, inedible version of the fruit we are used to eating. This is because virtually all modern fruit tree varieties are propagated clonally and haven’t been grown from seed for hundreds, if not thousands, of years. Thus, they have to be propagated by cuttings of wood from a tree of the desired variety. To make things even more complicated, most fruit trees cuttings then have to be grafted onto a special rootstock, which must be propagated separately. Grafting is a slightly complex horticultural feat, but fortunately, there is an easier way, though it only works with certain fruiting plants. Those on the list below do not require grafting; instead, the cuttings can be rooted directly, making it much faster and easier to get your food forest growing. 1) Take a 6- to 8-inch cutting of a healthy, supple branch from a tree with good quality fruit, making sure it includes at least two nodes (the enlarged bumps where the leaves emerge from the stem). The cutting should be about 1/4- to 3/8-inches in diameter. Keep the cutting warm and moist. One simple method is to secure a plastic bag over the pot with a rubber band as a mini-greenhouse and use a spritzer bottle to keep it humid inside. 3) Once the cuttings begin to grow from the top, it is a sign that a substantial root system has developed below and it is safe to transplant the rooted cutting. That’s the gist of it, but additional tips are included for each species listed below. These are evergreen trees and cannot be propagated with the dormant season method. Take cuttings in spring using the mini-greenhouse technique instead. Olives grow quickly to 30 feet or more, though they are restricted to regions where winter temperatures stay above 20 degrees. 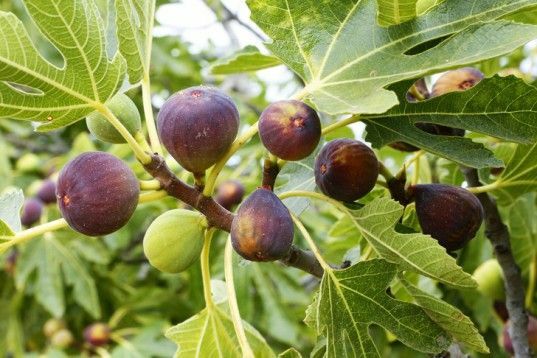 If you propagate them in late winter, figs are one of the easiest fruit trees to grow from cuttings. You can actually use much larger cuttings than the method above recommends—up to an inch in diameter and three feet long is fine—and stick them in the ground in their permanent location. Figs are slightly more cold tolerant than olives (15 degrees) and are one of the fastest trees to bear fruit from a cutting. They can be maintained as a 6-foot bush, allowing them to be grown in containers and brought indoors for winter in cold climates, or allowed to grow up to 20-30 feet tall. Pomegranates grow into beautiful 12-foot deciduous shrubs with huge red flowers in spring, which are very popular among hummingbirds. They are slightly more cold-hardy than figs, surviving temperatures as low as 10 degrees. Propagate with either of the methods listed above and look for one of the dwarf varieties to take cuttings from if you want to grow it in a pot. Mulberries aren’t typically found in grocery stores, because the fruit doesn’t keep well off the tree and is not able to be shipped. That said, eaten straight from the tree, they are as enjoyable as any other berry—sweet and flavorful, with a unique, chewy texture. Late winter is the best time to propagate them, just before they emerge from dormancy. Unlike figs, olives, and pomegranates, these trees survive winters in northern climates without batting an eye. Mulberries range from large shrubs to 40-foot trees, depending on the variety. Grapevines live for a hundred years or more and require a very substantial structure to grow on, as they develop trunks like trees and weigh hundreds of pounds when laden with fruit. They tolerate subzero temperatures and are a breeze to propagate with cuttings. Blueberries range from 4 to 12 feet tall, depending on the variety, and grow marvelously from cuttings. It is important to know that they need very acidic soil compared to most plants. In places where the soil is not naturally acidic, you can make it so, by mixing a hefty quantity of peat moss or decomposed pine needles (the more eco-friendly option) into the soil at planting time and keeping them mulched with the same material as they grow. Several different varieties of blueberries should be planted together, as they require cross-pollination. These guys grow like a cross between a shrub and a short vine and usually need some type of trellis to hold them up. They can be propagated by cuttings, but there is an even easier way. A mature patch of berries develops lots of little sprouts as it expands outward from the original planting. These can be severed from the “mother” plant quite easily by slicing vertically into the ground to the cut the root that attaches them and lifting out the little sprout with its own set of roots intact. Plant it immediately in its permanent location and you will have fresh fruit within a year. Success rates with cuttings usually range from between 25 and 75 percent, so always take more than you need. It’s nearly as easy to take 10 cuttings as it is to take 2, so you may as well propagate extra and share them with the neighborhood.